Few things make me more excited than coming upon artifacts from the previous lives of the buildings that I’ve studied. 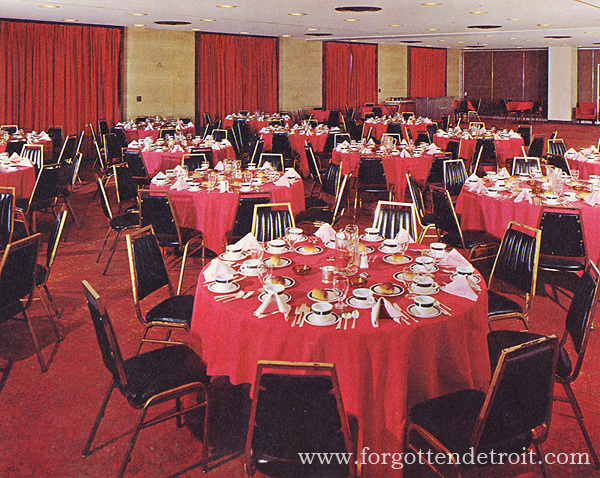 Previous posts commented on my memories of the Statler and of the Fort Shelby as ruins. But through artifacts I can get a taste of the buildings in a way that I never knew them. 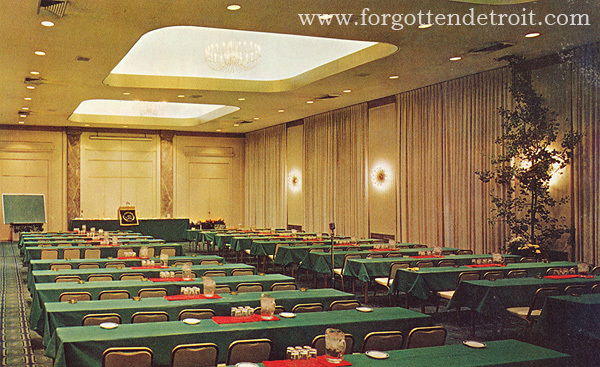 For this post I offer some selected scans of one of the Statler’s final pre-abandonment artifacts, a convention brochure circa 1968. 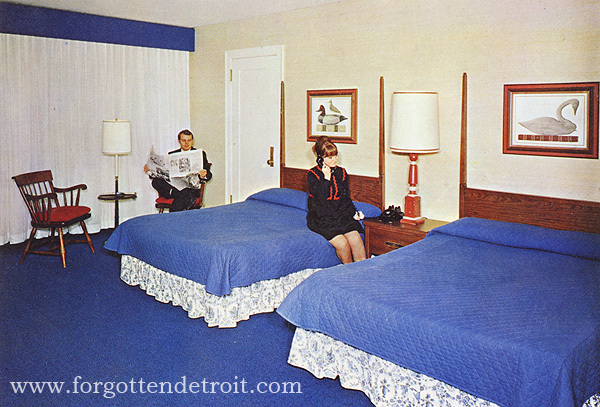 When this brochure was made the Statler was known as the Detroit Hilton and had just completed a final series of renovations. As an extra bonus, my copy of the brochure comes complete with a sticker pasted over the Hilton name announcing the hotel’s new ownership. Evidently the purchase price for the building included an unused stack of these things and the new owners couldn’t afford to let them go to waste. Take notice of the cover’s flashy appearance. Photography being burdened with horrible fads is nothing new. in the 1960s weird circular fisheye lenses were nifty and new. They are, thankfully, largely extinct now as they mostly will not work on modern cameras. Also note how, despite the sticker, one can still read “Hilton” on both the photograph of the hotel and the Hilton logo figures prominently on the lower left corner. Not to mention, Hilton is mentioned throughout the brochure. They needed more stickers. On the first page we get a more traditional view of the hotel’s exterior. 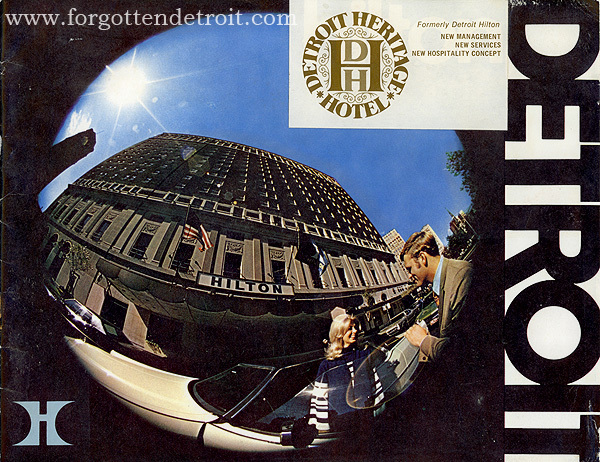 The brochure proclaims it as a “bold, brilliant new facade” that “heralds your arrival at Detroit’s most luxurious hostelry.” I don’t know about that. The facade still looks much as it did in the 1930s. The only indication of the date of the photograph are the two land-yachts on the lower left. The interior photographs, which make up the bulk of the brochure, tell a different tale. Here we see the full horror of a decade-long renovation program that stripped the hotel of most of its pre-WW1 grandeur. It wouldn’t have been so bad if this renovation program hadn’t happened to have occurred during a particularly dark period of design. 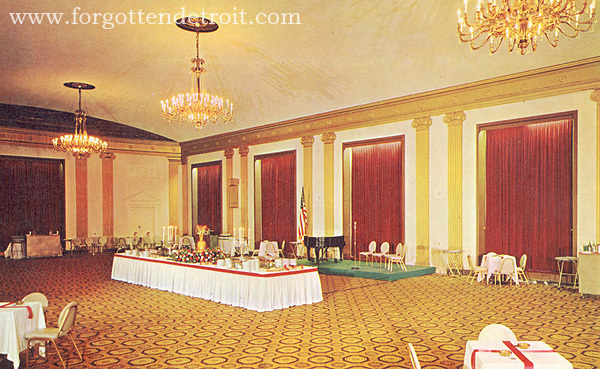 Note the clever use of a wide-angle lens to make the Statler’s old small rooms look much larger than they really were. The bed on the right looks like an Olympic-sized swimming pool. One of the results of the renovation that Hilton, and eventually the new owners, were quite proud of was the conversion of the old sample rooms on the upper floors into extra-large suites called the Hilton Towers. The sample rooms were large but fairly bare-bones. A traveling businessman could set up samples of his wares to show clients during the day and pull out a fold-away bed to sleep at night. Sort of like a small private meeting room. Well, by the 1960s the needs of the traveling businessman had changed. 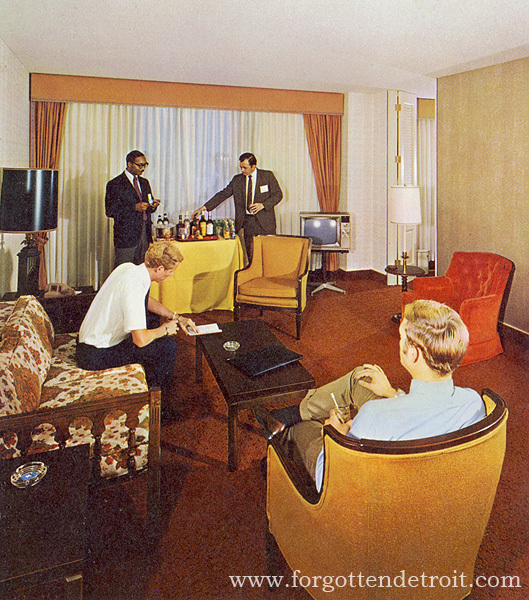 Now business was done with a generous amount of booze and 20-inch televisions. Or so this photograph could suggest. Given that this is a convention brochure, considerable space is devoted to praising the hotel’s ample meeting facilities. 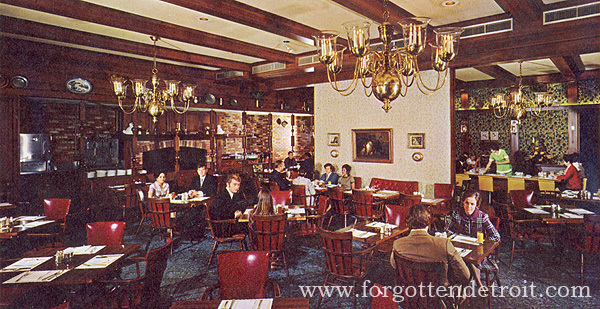 So here we get a rare view of the old Wayne Room before it became the tangled mess that I saw three decades later. Structurally the only change to the room since 1915 has been the installation of this hideous drop ceiling, covering up the rooms original vaults. Floor to ceiling curtains erase the windows, and effectively block any view of the neighboring Tuller Hotel. Given the times, I can’t help but wonder if this was deliberate rather than merely a photographic attempt to control light. At least the Wayne Room retained some of its dignity. One floor below we can see what happened to the old dining room and lobby. Floors have been cut through these once-grand two-story spaces and the upper portions turned into meeting space. 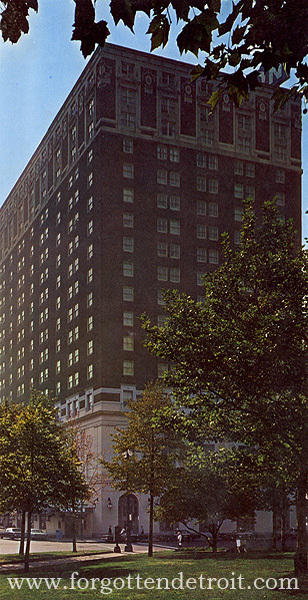 The Statler Rooms, pictured here, replaced the upper portion and elegant ceiling of the old dining room. Now I can understand the business decision in crafting out more profitable meeting space. Heck, Statler himself likely would have approved. But to replace grand architecture and materials with plywood covered with wallpaper? Again, note that our view of Bagley Avenue and the Tuller are blocked. At least the main ballroom has survived largely unaltered. Despite the rather nasty carpet and newer chandlers, it still provides example to the simple and elegant Italian and Adamesque interiors provided by Louis Rorimer. You would think, since this was a staged promotional shot, they would have included more tables. Perhaps they just wanted to show off the carpet. Our final image shows off the hotel’s new complex of restaurants. It was decided that the sleek Art Deco Terrace Room and Lounge Bar had outlived their usefulness and it would be better to replace them with a Bob Evans. Well, not really, but it sure looks like something you would find in a strip mall and not a grand historic hotel. I remember that fireplace. It was still there in the late 90s. Well, this is just a taste of what this particular brochure has to offer. And I have many more of these kinds of things. Suffice to say, there is more to come! Thanks for this post. I find myself being compelled to explore what is going on in Detroit. Thanks for your scholarship on the topic. Do you or anyone have any comments on safety or , conversely, what might be foolish to attempt when exploring Detroit? I particularly enjoyed seeing this brochure David. It is sometimes frightening to contemplate the damage done in the name of modernization, though a you say, E. M. Statler himself might have approved of such awful measures!